Aleppo is a destroyed city with no heat and electricity. People have little food and water. 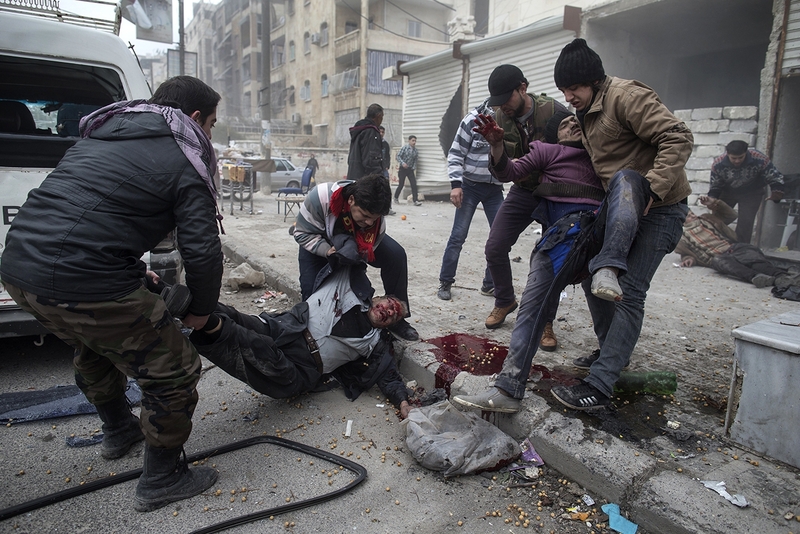 Aleppo, Syria 2013-01-13 A man helps carry the dead body of a civilian killed after a mortar attack in the Saif al-Dawlah neighborhood of Aleppo. Six people died and sixteen was injured. Aleppo, Syria 2013-01-27 At a small field hospital in Aleppo doctors helps a young boy with burns. 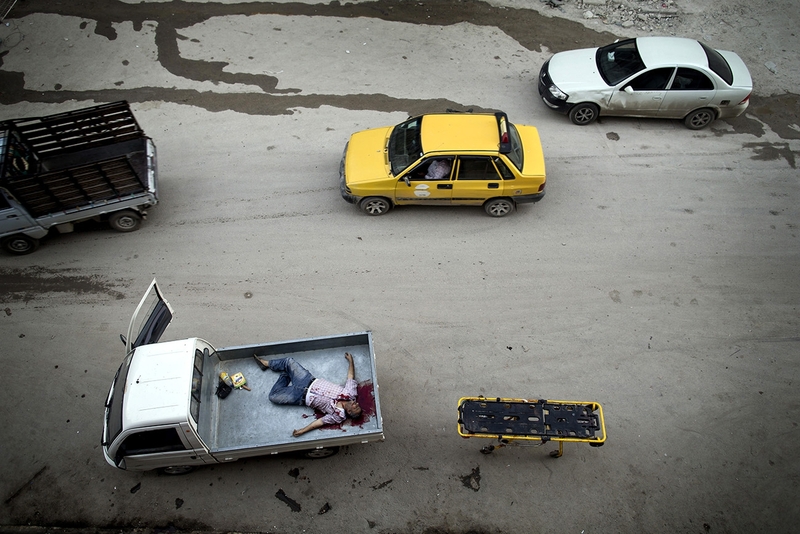 Aleppo, Syria 2012-10-15 A dead civilian outside Dar al-Shifa hospital in Aleppo is loaded onto a pickup truck for transport to his family. He was shoot by a sniper. 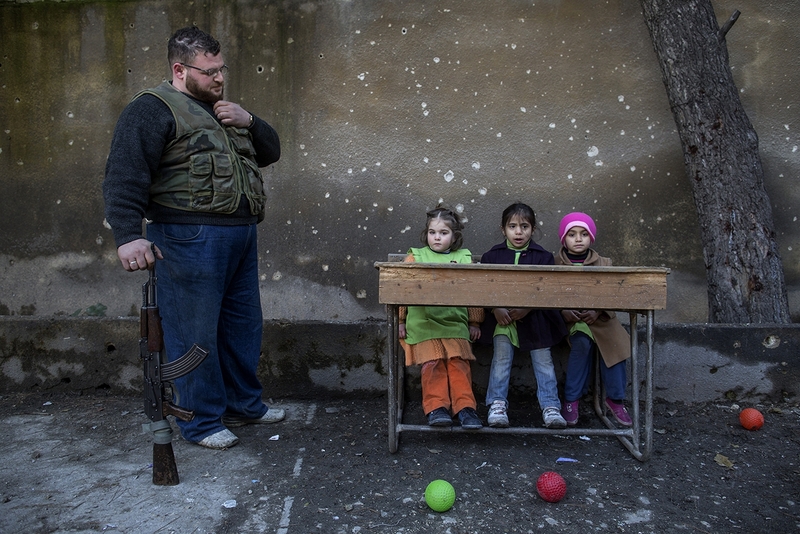 Aleppo, Syria 2013-01-13 Children sit on school benches at Al-Tawheed school in Aleppo. Most of the schools in Aleppo are closed. Due to no heat and electricity they move some classes outside. 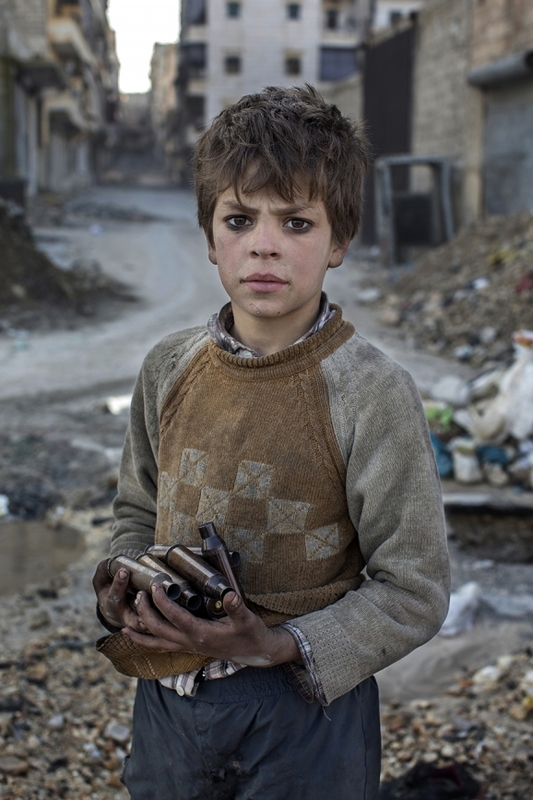 Aleppo, Syria 2013-01-14 Nine year old Alladin collects used ammunition near the frontline in Aleppo to sell as metal. 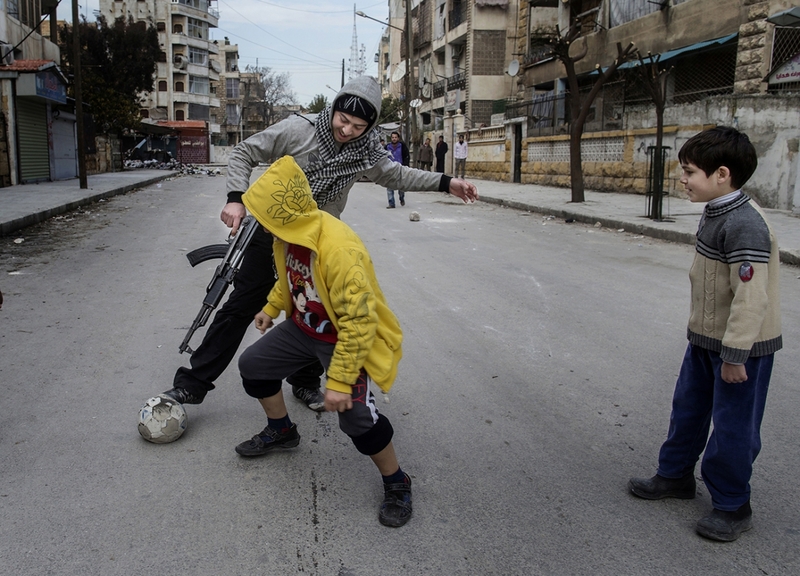 Aleppo, Syrien 2013-01-27 A Free Syrian Army fighter play football with some kids in the Saif al-Dawlah neighborhood of Aleppo. 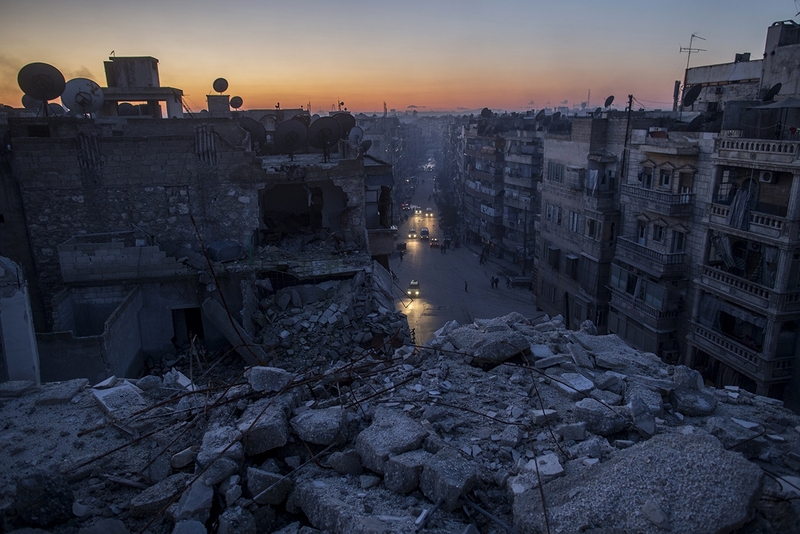 Only 50 meters behind them the battle for Aleppo is continuing. 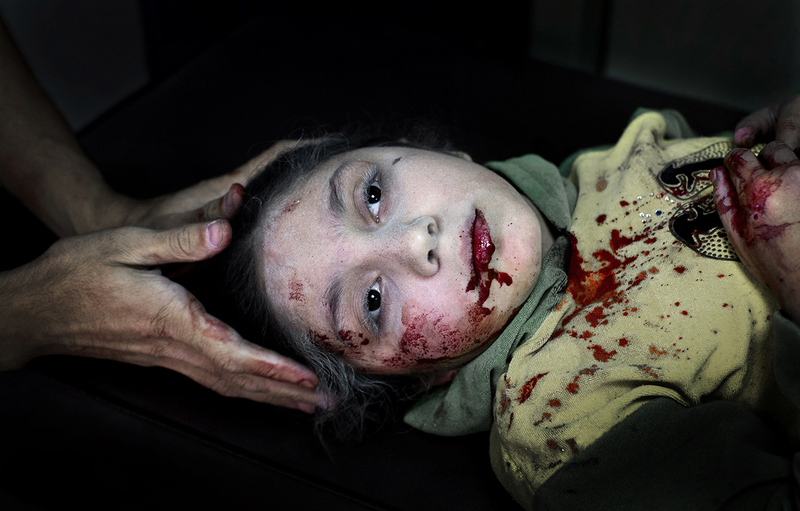 Aleppo Syria 2012-10-15 Dania Kilsi, 11, is treated for shrapnel wounds at Dar-al Shifa hospital. 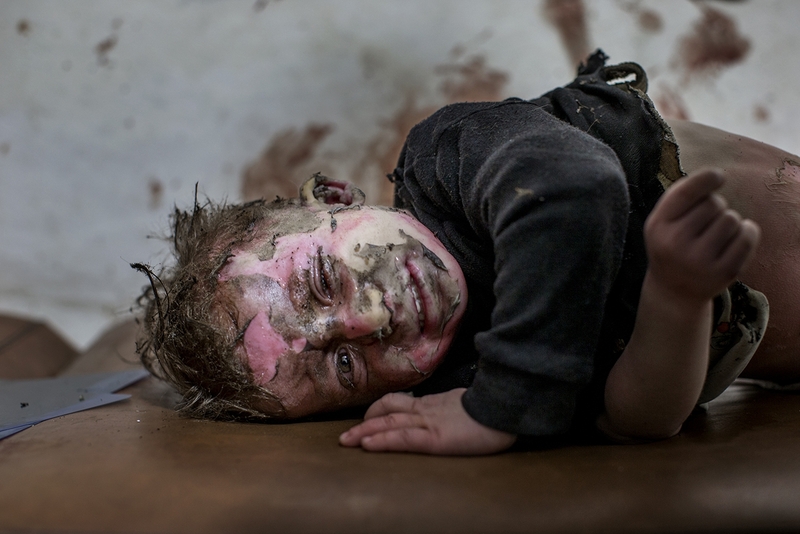 She and her two younger siblings, Zaid, 2 and Fatima 6, were playing outside their home when they got injured from a bomb. 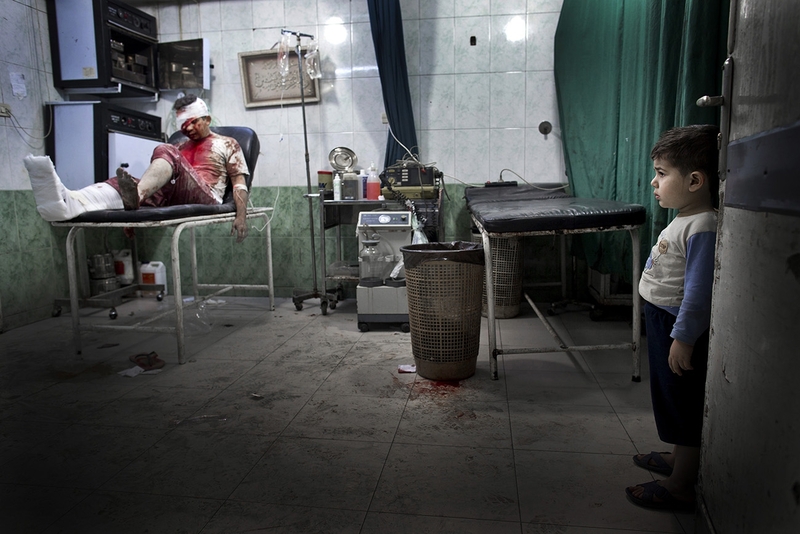 Aleppo, Syria 2012-10-15 A young boy in Dar al-Shifa hospital look at the injured patients. The injured man was brought together with his pregnant wife to the hospital. They are both in critical condition. 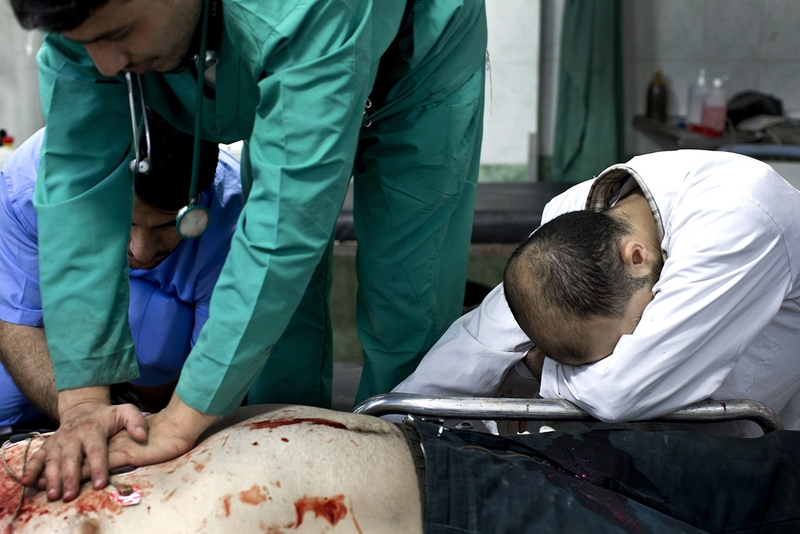 Aleppo, Syria 2012-10-15 Omar, 31, a Free Syrian Army soldier arrived to the hospital at 1.49 pm with a gun shot wound to the chest. Nine minutes later he was declared dead. 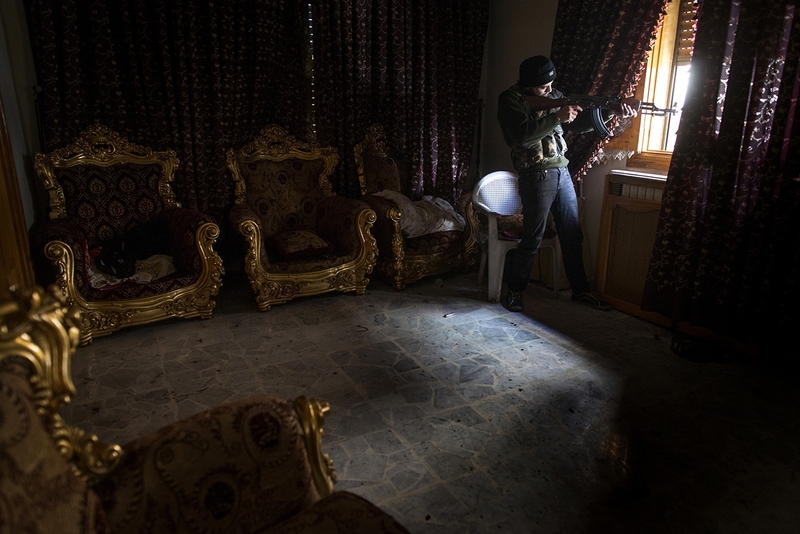 Aleppo, Syria 2013-01-13 A Free Syrian Army fighter aims his gun in the Saif al-Dawlah neighborhood of Aleppo. 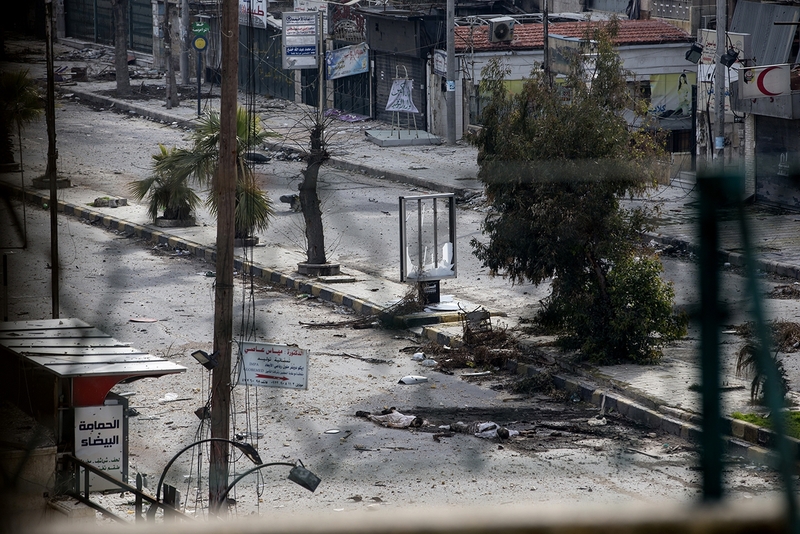 Aleppo, Syria 2013-01-27 Two dead bodies lie on a street in the Saif al-Dawlah neighborhood of Aleppo. The street is a no mans land. On one side is the regime and on the other is the Free Syrian Army. 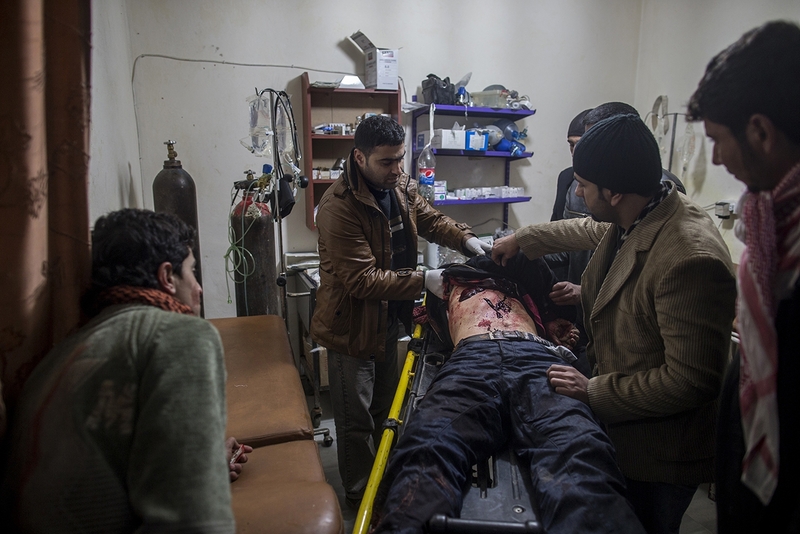 Aleppo, Syria 2013-01-27 On a small field hospital in Aleppo doctors examine a man shot by a sniper. They can do nothing. He is dead. 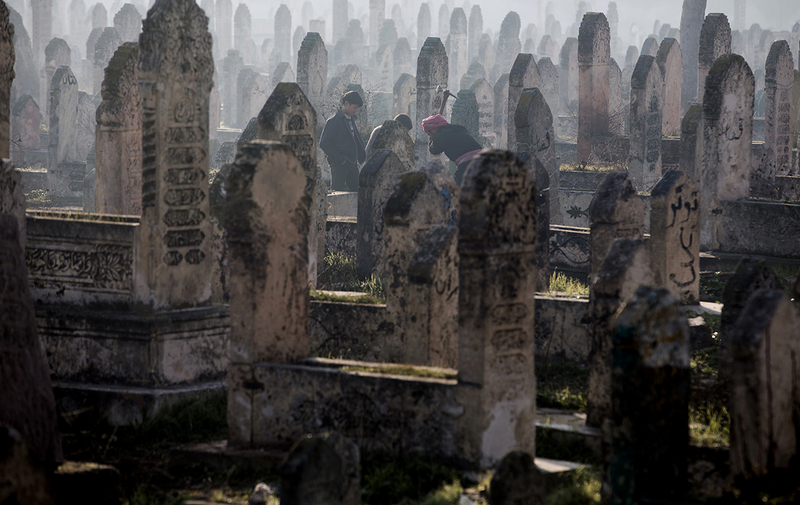 Aleppo, Syria 2013-01-15 A man is digging a grave on a cemetery in Aleppo while he´s children watches. 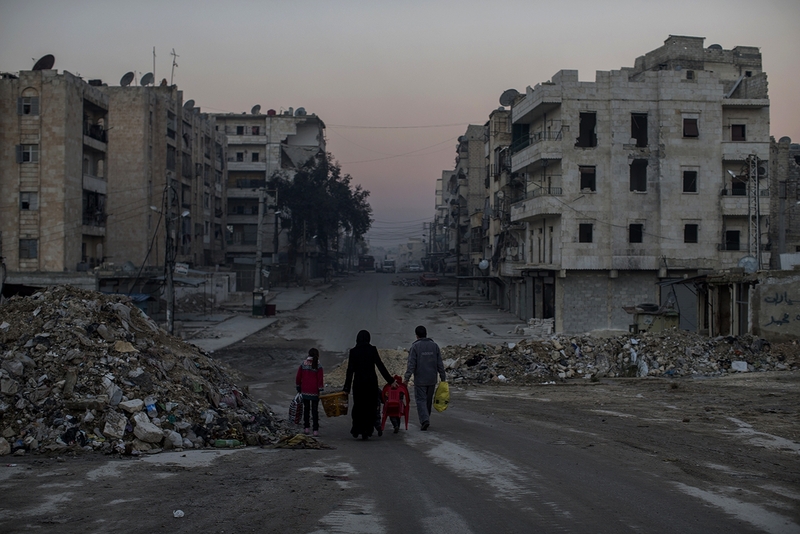 Aleppo, Syria 2013-01-15 A family walks on empty streets of Aleppo. Trying to live a life in the war torn city.